Topics: Leisure, Local Area, Maps & Travel, and Offers And Deals. 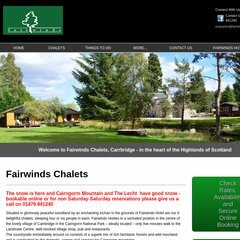 fairwindschalets.co.uk Summer breaks, autumn winter spring midweek and weekend short ..
fairwindschalets.co.uk self catering short breaks and holidays in Aviemore and the ..
fairwindschalets.co.uk Hotels near Strathspey steam railway steam trains train journeys ..
fairwindschalets.co.uk Hotel great rates hotel deals cheap bargain weekend breaks late .. The programming language environment is PHP/5.4.12-2~lucid+1. Its 2 nameservers are ns.rackspace.com, and ns2.rackspace.com. Vlans England is the location of the Apache/2 server. PING (89.234.8.19) 56(84) bytes of data. A ping speed test response, is timed at 242 ms.